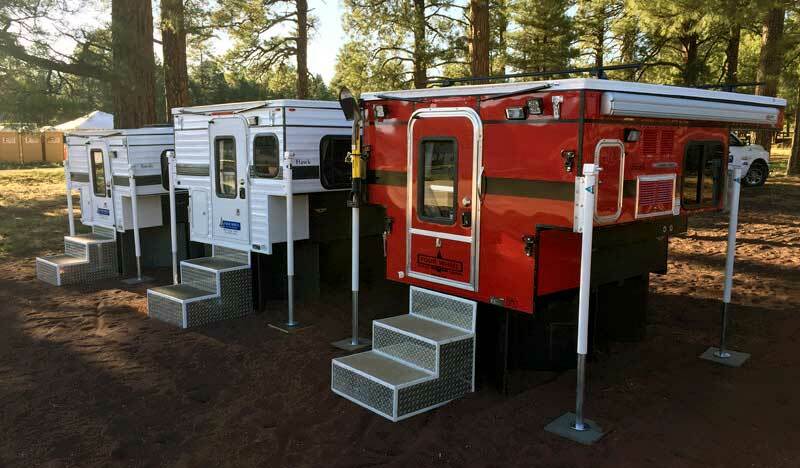 Last week we published, “Four Wheel Camper Color Concept” and showcased a very red, one-of-a-kind Four Wheel Camper on display at the Overland Expo West. At the end of the article, we asked Truck Camper Magazine about their interest in exterior colors for truck campers. 633 readers chimed in – a relatively good number. 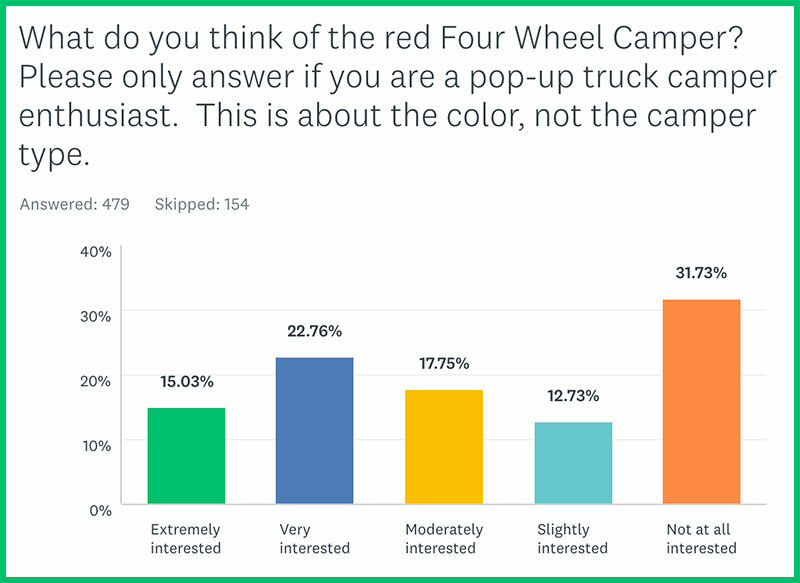 47.71-percent said they would be extremely interested or very interested in having their truck camper color matched to their truck. In contrast, 32.39-percent said they were slightly interested of not at all interested at all. Essentially, half the respondents said, “Yeah, I’d be interested,” and a third said, “No, I would not be interested”. 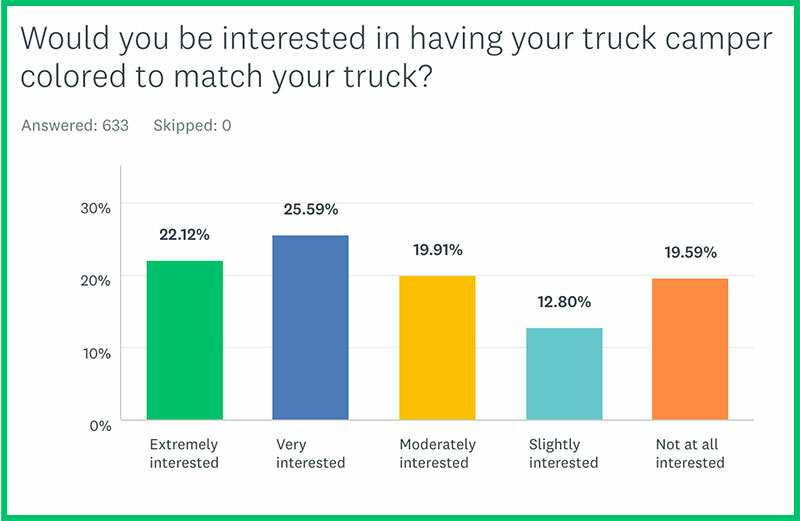 The middle 20-percent said, “Maybe.” That’s a very strong response for the industry to look into color matching trucks. The plot thickens. Here the results are very clearly in favor of full-body color graphics. Okay industry, start your paint booths. 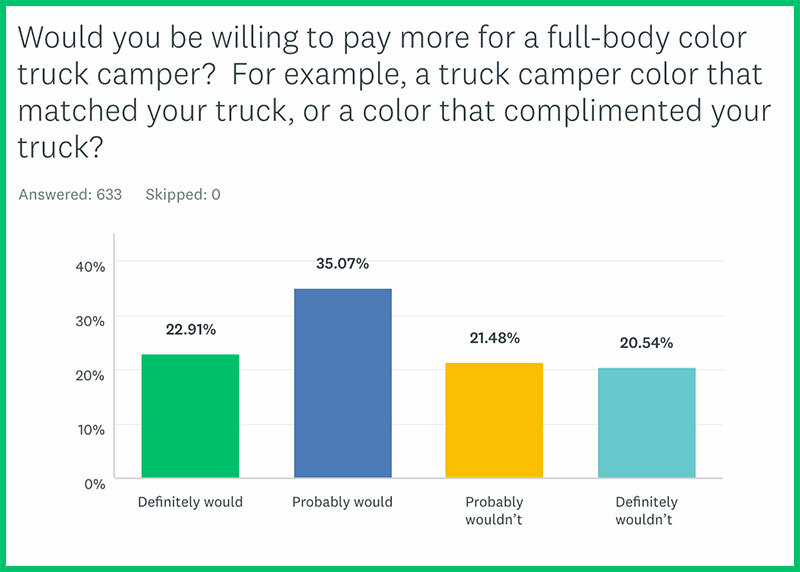 Essentially, 57.98-percent said, “Yes, I’d pay more for a color matched truck camper” and 42.02-percent said, “No, I would not”. 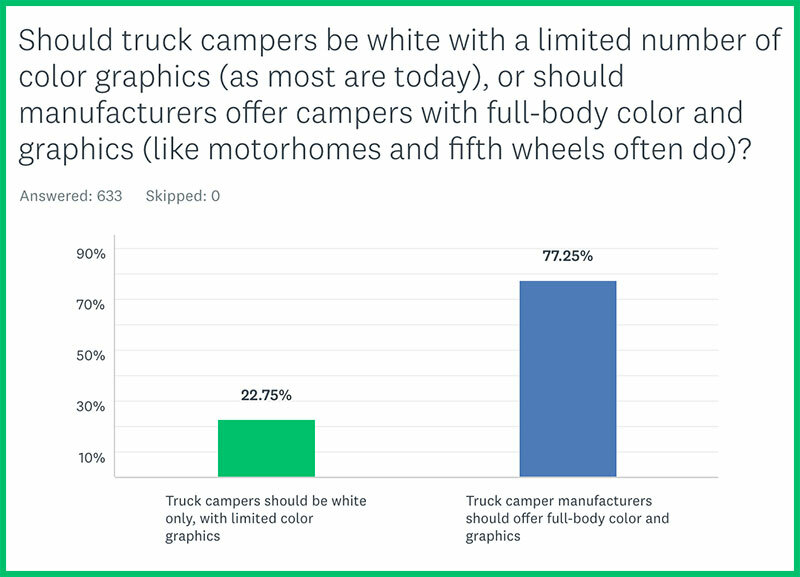 This chart makes sense when you look back at the first chart, and further demonstrates the marketplace potential for color-matched truck campers. We asked respondents not to answer question 4 if they were not pop-up truck camper enthusiasts. 154 people skipped the question. That’s roughly 32-percent. Since a good number of hard side enthusiasts probably skipped an article about a pop-up camper, this percentage makes sense. When we combine “Extremely Interested” with “Very Interested”, we get 47.71-percent. That’s identical to the positive responses in from question 1. This is another clear demonstration that folks really are interested in color. It’s also extremely compelling news for Four Wheel Campers. We may all be seeing more red Four Wheel Campers in the future.